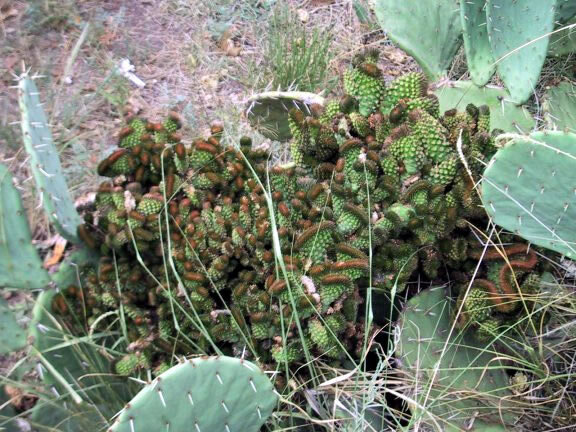 Question: geographic_location: Found in Ft. Davis, TX I have a picture of an abnormality on a prickly pear cactus growing in central Ft. Davis, TX. It appears to be a growth on the host cactus. It is dark green in color and has a soft, non sharp, surface that seems to mimic spines. Answer: This is a monstrous prickly pear.This deformity happens very rarely in nature. I have only seen two other in the wild. One in South Florida and the other out side of San Saba Texas. This seems to occur in plants when there is a DNA mess up or when the plant has been damaged by a bite from some type insect. Most of this type of deformity is very weak and will not stand as much cold or long dry spells as the mother plant. 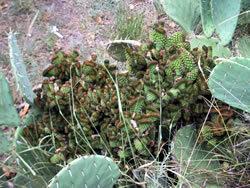 It sure is a wonderful plant and I would like to obtain cutting for my Texas prickly pear collection. If you would like to discuss this plant or other cactus with me contact me at Claude Townsend C & E Cactus & Things Nursery in San Antonio, Texas.